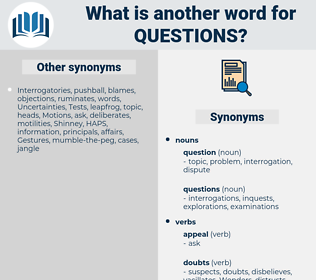 What is another word for questions? 2007, two, 23, 1995, 13, 11. Persons, preguntas, peoples, Rights, Studies, Consultations, issues, Difficulties, FAQS, matters, problems. consultation, Consultations, resolution, evaluation, verification, decolonization, disputes, quote, conclusion, conclusions, transportation, issues, appropriations, education, difficult, organization, consultative, coordination, chairperson, investigates, conditions, investigating, sustainable, lisbon, initiatives, promotion, budgeting, administrative, labour, society, headquarters, adoption, technology, liaison, rapporteur, e., parliament, environment, Including, economic, asuntos, management, OSCE, achieves, FAQ, FAQS, hits, coordinator, aboriginal, Danny, english, discusses, joint, force, see, history, de, fighting, special, expert, regional, a., programme, marks, national, budgetary, adviser, cambodia, Reached, advisory, ACABQ, strategy, matter, matters, first, annex, ill, financial, june, haiti, ip, executive, h., centre, achieve, human, plan, fragen, america, WIPO, Isa, state, summary, health, hiv, UNCTAD, posts, officer, XXXXXX, :, welfare, law, funding, issue, iii, discuss, problem, problems. clarifications, institutions, Suggestions, assumptions, assertions, solutions, yes, situations, Negotiations, deliberations, circumstances, Controversies, explanations, Recommendations, objections, jurisdictions, supplementaries, complications, Regulations, responsibilities, purposes, allegations, interventions, decisions, options, Organizations, reservations, ramifications, comments, limitations, Interviewing, cooperation, prohibition, subtopics, reflections, implications, principles, shortcomings, petitions, applications, sub-topics, reactions, Respondents, concepts, Hypotheses, doutes, expectations, answers, Wonders, things, times, positions, Phenomena, opinions, regions, Persons, reasons, directions, differences, troubles, Publications, documents, statements, interests, sessions, attributes, terms, tasks, representatives, functions, actions, constraints, location, locations, notes, factors, sensitivities, details, instances, requested, infringements, provisions, sub-items, subparagraphs, remains, words, reports, orders, Tests, delegations, hours, sources, objects, Expenditures, sites, requests, Guidelines, means, incidents, components, facts, choices, disorders, response, responses, substances, others, obstacles, sentences, Resources, L, applicants, fields, participants, relations, objectives, ministers, complaints, references, perspectives, spots, asks, owners, Replies, thoughts, spheres, findings, proposes, arrangements, links, personnel, misgivings, developments, mechanisms, Complexities, indicators, Measures, sectors, clusters, dialogues, procedures, cuestiones, phrases, rules, effects, results, My, METRS, outcomes, conflicts, grounds, Surveys, us, projects, peoples, priorities, services, events, Deficiencies, stakes, cards, who, debates, individuals, demands, estimates, changes, remarks, headings, Stories, Records, domains, Attitudes, proposals, counts, portfolios, particulars, files, defects, parts, Rights, Worries, Risks, costs, groups, stops, talks, Patients, elements, maintenance, speeches, unknowns, sponsors, values, respects, outlets, presented, Refugees, Efforts, Studies, causes, processes, basics, Researchers, sides, methods, fronts, Standards, Goals, signs, politics, Ones, contacts, leaders, merits, Companies, reserves, speakers, FACETS, dollars, code, ways, funds, products, experts, needs, chapters, Ideas, features, ills, sets, people, authors, Consultations, kinds, hazards, Agencies, stakeholders, maters, WOES, courts, ?, annexes, is, dots, claims, members, variables, IMPACTS, examples, Entries, approved, *, ec, exchanges, trails, practices, types, views, Tracks, wishes, road, materials, Classes, Forms, departments, officers, stitches, leads, approaches, _, Activities, Parties, disputes, data, conclusions, calls, issues, appropriations, place, places, arrests, ", Policies, 2003, date, 35, meetings, LINEs, conditions, Difficulties, initiatives, Him, FAQS, hits, see, marks, matters, annex, posts, :, issue, problem, problems. troubleshooting, sir, cluster, entirety, topic, needle, brandy, mail, fighting, matter, matters, issue, aspect. understood, yeah, yes, Anybody, Worries. Inquired, noted, raised, proposed, Asked, Told, said, shut, Was, Were, Took, wanted, added, called, Had, failed, Dealt, matters. wondering, understanding, Addressing, Arising, confronting, Responding, integrating, Assessing, spending, drafting, facing, protecting, regarding, talking, emerging, going, dealing, meeting, issues, funding, asking. Issued, outlined, involved, raised, Submitted, coordinated, identified, suggested, Asked, tabled, associated, designated, allocated, integrated, faced, devoted, set, Aimed, taken, failed, contained, Dealt, done, Reached, issue. note, dictate, pray, wonder, ask, issue, request, demand. 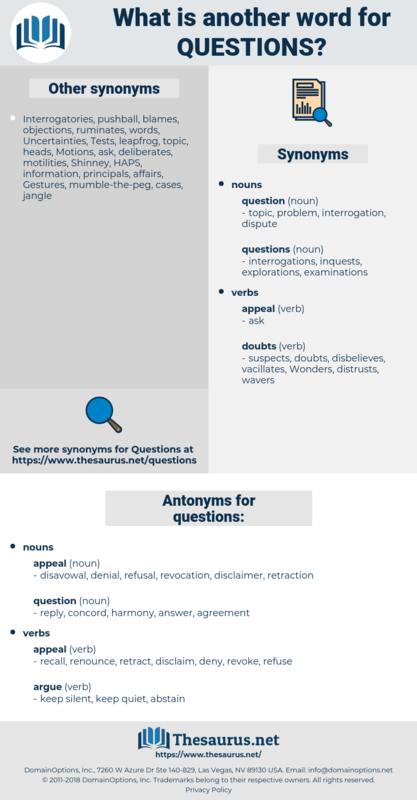 Queried, application, poses, suspects, contradicts, considers, raises, involves, jeopardises, Addresses, presents, examines, submits, lies, jeopardizes, requires, applications, Comes, delivers, threatens, undermines, Wonders, Denies, provides, Focuses, follows, dismisses, prompts, seeks, Gives, relates, remains, regards, objects, requests, believes, asks, Has, misgivings, wants, stabs, demands, estimates, causes, puts, needs, Does, is, dots, claims, views, disputes, calls, issues, investigates, achieves, hits, ask, marks, advisory, matters, posts, request, problem. note, show, build, wonder, ask, issue, request, demand. quotation, division, divisions, Difficulties, budget, Budgets, public. discussions, interpellations, determinations, inquires, investigations, interrogations, hesitations, requirements, observations, Interrogatories, arguments, Uncertainties, contents, submissions, suspicions, Interviews, dossiers, journalists, themes, reporters, agendas, questioning, eyebrows, Budgets. questioning, oral, theme, asking, enquiry, sub-item, concern. wolverine, matter, matters, concern, discuss. disavowal, denial, refusal, revocation, disclaimer, retraction. reply, concord, harmony, answer, agreement. recall, renounce, retract, disclaim, deny, revoke, refuse. keep silent, keep quiet, abstain. What do you mean by all these questions? Oh a little while after the gentleman asked his questions.